Was Trump really negotiating an immigration deal with a bipartisan group from Congress while the cameras rolled? Sure looked like it. The president was even urging what he called a “love bill” to fix DACA, the Deferred Action for Childhood Arrivals program that he ordered terminated by March 5. Turns out it was all a “Look Ma, I’m President” move intended to do more for Trump (like he’s really smart, you know?) than it did for Dreamers–the undocumented kids brought to the U.S. by their parents. And before the day was over, it was a federal judge in California who actually made a real difference. Late Tuesday night, U.S. District Judge William Alsup in San Francisco issued a nationwide preliminary injunction that blocked Trump from killing off DACA before several lawsuits challenging the program–by state attorneys from California, Maine, Maryland, Minnesota, the University of California, and DACA recipients–were resolved. Last September, the Trump Administration couldn’t wait: they announced plans to end DACA and stop accepting renewal applications after Oct. 5. Judge Alsop’s ruling now allows anyone with DACA status on Sept. 5 the right to renew. And it buys a little more time for Congress to come up with a permanent solution instead of rushing to make what looked like a March 5 drop-dead date. The judge’s late night ruling doesn’t render what we saw earlier in that strange on-camera White House meeting moot. It did prove one thing: Donald Trump must be pretty desperate after author Michael Wolff’s “Fire and Fury” raised issues of the president’s competence to pull off a stunt like that. I say desperate because Trump in the meeting seemed to be acting oddly normal. He actually seemed affable and collegial. But that’s when you really have to be careful of the con. Is it real or is it a setup? By allowing the cameras to roll, Trump was letting the public to be the “fly on the wall” as he conducted business. It was more like Trump’s Wolff repellent. That pre-meeting for the cameras was really a “fake meeting.” Something to let Trump look reasonable, in control, even, heaven forbid, likeable. We all lived through 2016; we deserve to be suspicious. At the fake meeting, Trump said he would sign whatever immigration bill the bipartisan group of Congressional members brought to him. He even spoke about DACA, the Obama order he seemed hell bent on killing last September, with uncharacteristic emotion. Yes, this is the same Mr.Travel Ban, Mr. No Kneeling During the National Anthem, uttering the word “love” twice in the same sentence. But Trump still wants that border wall and says that as a builder, he can get it done for less than $18 billion. Maybe he can, but linking border security as a condition to allow relief for DACA recipients is sure to be like a wall in Congress some won’t be able to get over. SEE, HE’S NOT CRAZY, HE’S A STABLE GENIUS (LIKE MR. ED?) With just a little He addressed the Wolff book without inadvertently talking about it. On immigration and DACA, Trump moved away from his white nativist base toward the middle, while still being tough about that wall. Right-wing conservatives hated to see the lovefest meeting. Personally, if Trump is sincere and says he wants to take more heat, let’s turn up the heat for the devil. Said Trump, being deferential and obsequious at the same time: “You folks are going to have to come up with a solution. And if you do, I’m going to sign that solution. We got a lot of smart people in this room. Really smart people. We got a lot of people, good people, big hearts, they want to get it done. I think almost everybody, I can think of one or two I don’t particularly like (medium-sized laughs and guffaws filled the room). And so by the time the meeting ended, it was a nice topper that Breitbart News announced Steve Bannon had left his job as its executive chair. Everything seemed to be going for Trump, until a California federal judge gave him a lesson on the limits of power and the importance of checks and balances. If you were watching, you saw that Asian Americans were represented at that meeting. 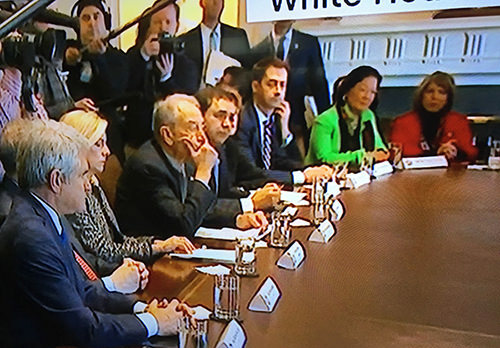 Sen. Mazie Hirono was at the table. Trump acknowledged her with a “Yes, Ma’am,’ and Hirono introduced herself. Trump said he knew who she was. Fortunately, he didn’t try a “you all look alike” joke. HIrono, self-described as the “only immigrant serving in the United States Senate, right now,” asked Trump whether his DACA position was still contingent on building that $18 billion wall. Trump filibustered and didn’t allow for a follow up. But I’m glad Hirono got to ask a question. Sen. Mazie Hirono (D-HI) in fluorescent green couldn’t be missed, but somehow she was. Later on the cable news when TV graphics showed who was present, Hirono’s face wasn’t even included. Not on the graphic I was watching. To which I can say, #MeToo. We all know how it feels to be left out and forgotten. A small slight? Toughen up, you say That’s what they told victims of sexual harassment. 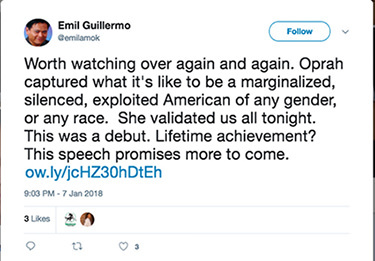 Women of color know that sexism and racism combined is one hell of a toxic cocktail. But men of color know too, a dash of racism is all it takes to devastate a life and career. There’s still a lot of it around, and we’re all still taking it. Some people want us to think it’s over, and that it’s all just an example of victim mentality or a sign of weakness. But racism is just so insidious these days. It’s absorbed and forgotten. Maybe it wouldn’t happen so much if Oprah were president. I was amazed by Oprah’s acceptance speech for the Cecil B. DeMille Award at the Golden Globes last weekend. I wasn’t initially expecting anything. But the nine-minute speech had a soaring arc that acted like a magnet. By the end, it was every bit as good as any keynote political convention speech I ever covered. I started out in TV, sort of like Oprah in the ’70s. I know what she’s had to overcome. In fact, she didn’t just overcome; she obliterated anything in her way. I admire that a great deal. I couldn’t do it. A chicken in every pot is one thing. But “You get a car, you get a car, you get a car” would be a different kind of campaign slogan. I liked Oprah’s speech. But presidential politics isn’t the high school student body election, where it’s all about popularity. Shouldn’t the nerds be president? The people who really know how to govern? Or is their unattractiveness the reason we crave people like Oprah to lead us? In some ways, the thought of two famous billionaires duking it out just seems antithetical to our democracy. Trump is his own case study. He knows business but his instincts are all wrong. In that immigration meeting, Trump talked about wanting to bring back to the budgeting process earmarks. Earmarks?! They’re OK for private business, but they are the hallmark of corrupt deal-making in government. Oprah’s style is different. She knows how to connect with everybody and would have something Trump doesn’t have: a sense of humility and a genuine appreciation for common folk. At this time, Oprah hasn’t ruled out running, if we’re to believe Oprah whisperers like Gayle King. But I think whether she runs or not boils down to her belief in public service. This is why billionaire Trump isn’t a good president. He’d be better as king. By being such a bad president with an approval rating in the 30s, he’s created the reason why people flock to someone like Oprah. She’s likeable. She’s glamorous. She’s more than Trump’s “like smart.” She reads. And she’s rich enough to fund her own campaign. Oprah would validate us all. She’s not seen as self-interested and successful. She’s a giver, not a taker, and would instantly fill the leadership vacuum Trump has created. That’s what we hunger for, someone who would bring us together as a nation. Oprah’s a real threat to Trump. And that’s why Trump knew he had to mention something when reporters asked about it, at the end of the immigration meeting. Oprah isn’t Trump. But she still may find that compared to a billionaire’s life, being president is practically monastic and requires sacrifice to be a public servant. What’s left for Oprah to accomplish in life but to become the ultimate anti-Trump? I say she runs. But only if she feels called in this special moment in our history to make America America again.